Most people would do anything to get into the Magisterium and pass the Iron Trial.Not Callum Hunt.Call has been told his whole life that he should never trust a magician. 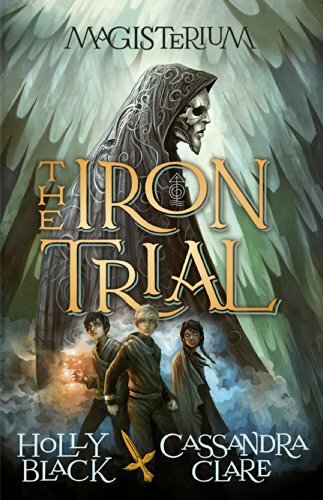 And so he tries his best to do his worst - but fails at failing.Now he must enter the Magisterium.It's a place that's both sensational and sinister. And Call realizes it has dark ties to his past and a twisty path to his future.The Iron Trial is just the beginning. Call's biggest test is still to come . . . So I am a massive fan of Cassandra Clare, like both TMI and TIF are up there in my favourite series list and then, what's that you say, a new book by Cassandra Clare, about Magicians and adventures and A FREAKING GORGEOUS COVER. Like if I'm honest the cover and story don't even matter, I'm pretty sure I'd read anything with Cassandra Clare plastered on the front so that's a fraction of why I want to read this. But then guess what. Not only is it Cassies' book but its also written by Holly Black. Are you serious. Holly Black is an insane writer and she's just gone and written a book with Cassie. I don't think a book could be any more perfect, and I genuinely can not wait for this. I can not.